Example 2. Instead of WW2 German Hetzers in the village the time is mid 1980s. One US M-1 tank is now watching the area. 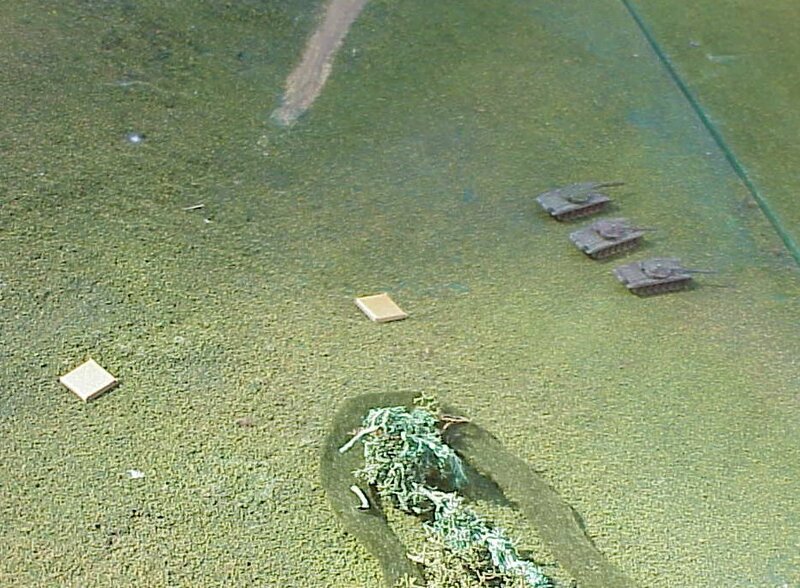 Instead of British tanks entering from a woods, three Soviet T-72s are moving behind it. The M-1 was ordered to Cover the area. It declares an over-watch point on woods #1. But the Soviets don't waste time going slow through woods. They swing around the woods. An M-1 is stationary among buildings and houses. It is declared to be unbuttoned. 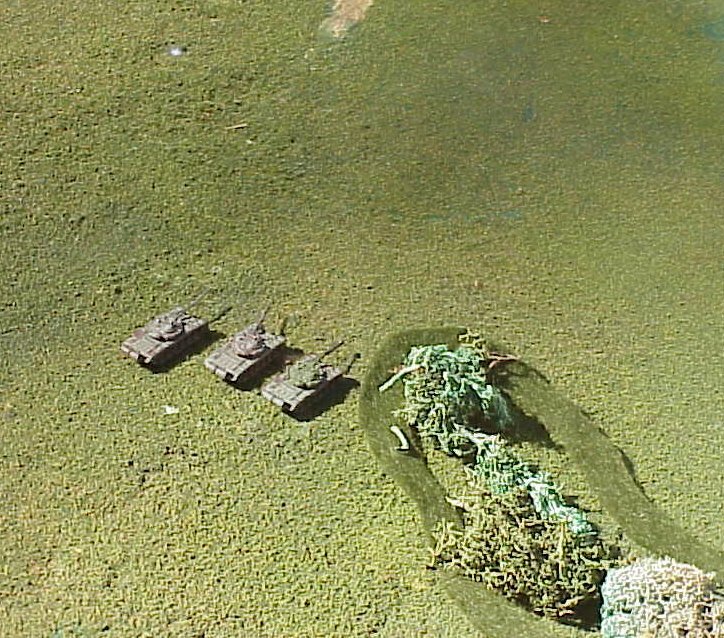 T-72s platoon begin the scenario behind the woods. They declare they are buttoned up. T-72 orders are to Rush toward the railway station. The M-1 orders still are to Cover. The T-72 moved full at 230 per turn. 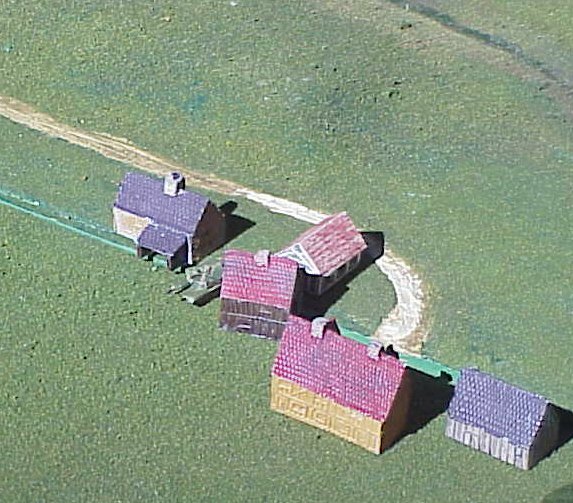 Markers are placed at the half-move point and the starting point. 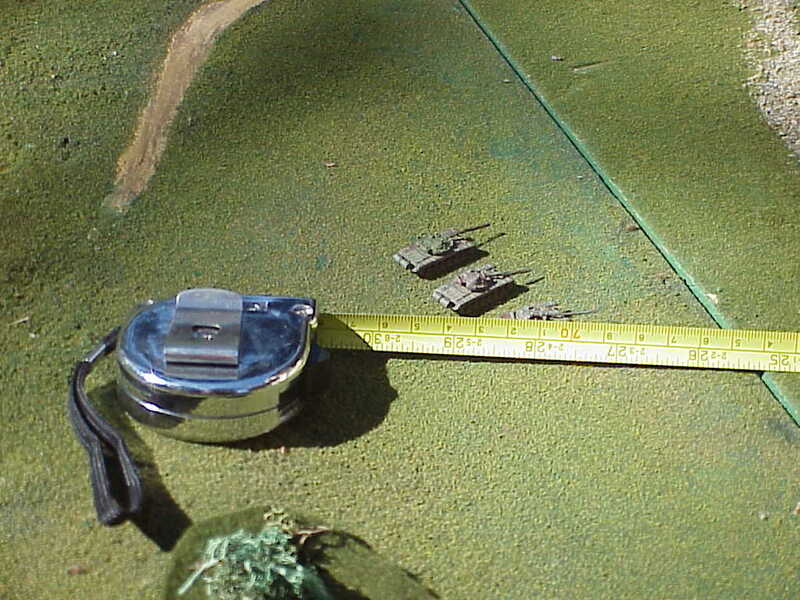 A measurement is made to determine the range from the M-1 to the T-72s. It appears to be 710 gsu. For sighting of moving vehicles the base sighting factor of the unbuttoned M-1 is 40. Targets are moving (+15) giving 55. Target size of 0 means no change. The average range would be 2200 gsu. A variable D10 is rolled. It is a '2'. This still allows the M-1 to sight these tanks up to 1100 gsu. Thus the T-72s are sighted. The T-72s are not within 400 of the M-1 nor are they within 50 of its overwatch point, thus they cannot be fired by the main gun of the M-1 this turn. Another Rush order is given to the T-72s. They again move full (235) toward the railway station. Chits mark the starting location of their move and the half-way point. The end position of the T-72s is 475 away from the M-1 and the mid-point is 592. Turn 2 Fire segment 1. 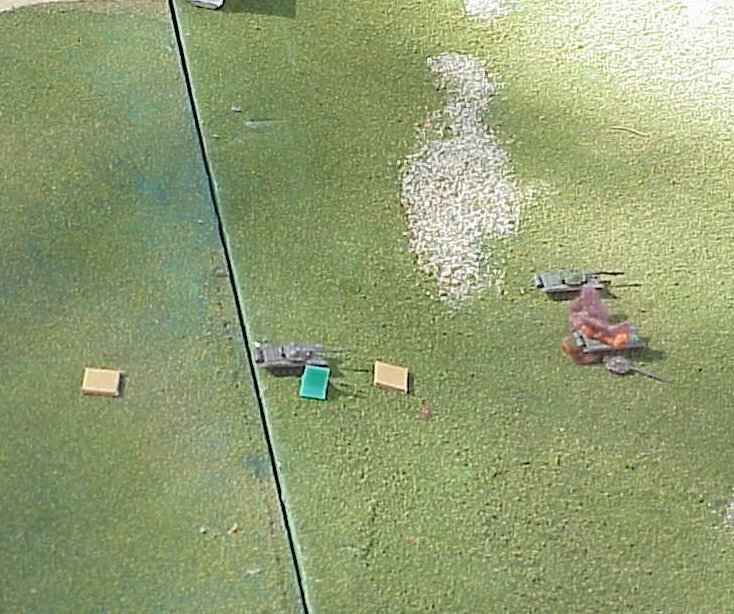 The M-1 fires its 105mm cannon at the T-72 it tagged with a laser last turn. The range can be no less than 592. To-hit at this range is the APFSDS M774 is a base 4. Target size is 0 so no adjustment for that. Target moving (+1). As the range is over 300 a +1 might have been added but since the target was tagged with a laser the previous fire segment there is no penalty. Thus the total is a 5 or better to hit. The M-1 rolls a 9 to hit. This is shy of getting a second hit so only one hit is scored. A location 1 is rolled. Track hit. The damage for this round is 6. Since it is a track a 4 or better breaks a track. The roll is 8 so the track is broken. The T-72 is set all the way back to the mid-point of the move and a green marker is placed next to it signifying a broken track. Turn 2 Fire segment 3. The M-1 now fires on one of the still moving T-72s. The range is at the minimum for the turn at 475 away. At this range the base is 3. Target moving (+1). As this is not the first shot at the group no +1 over 300 is added. The number needed is a 4. The M-1 rolls a 9. This is 5 over the number needed and results in two hits. Since both T-72s are within 75 of each other and the M-1 is considered a fast turret turning vehicle the US player opts to take one hit on each T-72. Assuming they are T-72M1. One hit is at location #8 and the other is location #2. The penetration of the M774 at 475 is 41 cm. The armor at location 2 is 17. The variable penetration D6 die roll is a 5. For APFSDS on underline armor is maximum penetration. The lower hull is easily penetrated. The damage roll is a 7 which is enough to brew up this T-72. The second T-72 was hit in its turret location 8. The armor there is 44. A D6 variable penetration roll of '6' backed by a '2'. This too is maximum penetration. Only it is less than 44 cm. so no penetration is achieved. A stun D10 die roll is allowed. 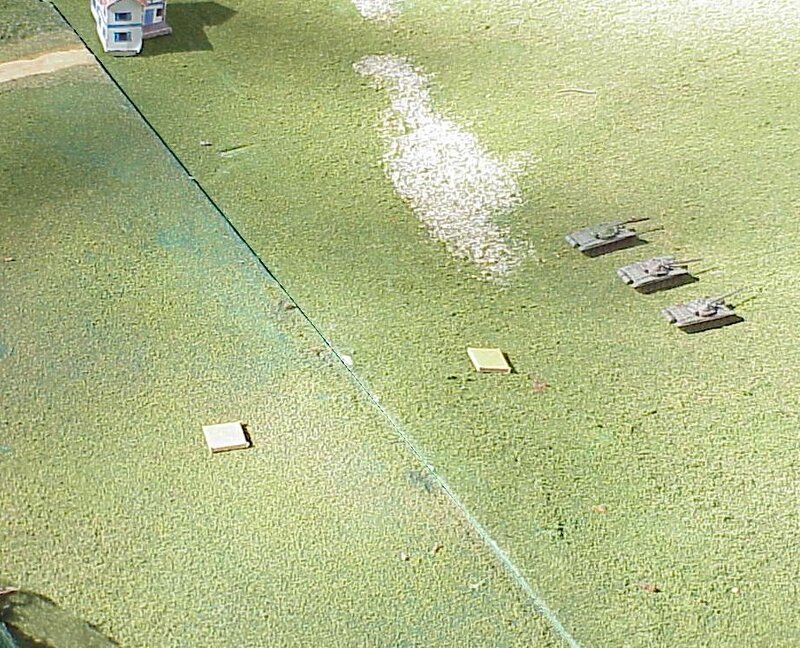 A '5' is rolled and 9 is needed to stun the tank. Here our scenario example will end. The T-72s may not even sight the M-1 as they are buttoned up and moving.